MANCHESTER, England (AP) — Sergio Aguero was involved in a confrontation with a Wigan fan as ugly scenes marred the end of the third-division side's shock FA Cup win over Manchester City on Monday. Fans spilled on to the pitch at DW Stadium as the host celebrated its 1-0 fifth-round win against the runaway English Premier League leader. Aguero appeared to hit the supporter after the fan said something to the player, and Aguero had to be held back by his City teammates. 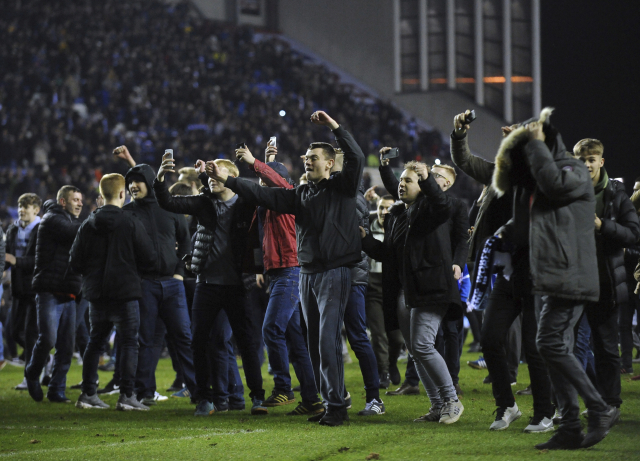 Advertising hoardings were also ripped out and thrown as a pitch invasion by Wigan fans got out of hand while the defeated City players were being escorted off the pitch. Footage also appeared to show objects, including an advertising board, being thrown at police officers by fans in the City end. City manager Pep Guardiola said he was in the changing room and did not see the Aguero incident. "It's safer when the fans are not there, but sometimes it happens," he said. Wigan counterpart Paul Cook was also in his changing room at the time. "It's not correct (pitch invasions), but I haven't seen these incidents so I'd rather not give an opinion, but players' safety is paramount for everyone."